"Britain needs more companies like WEC!" 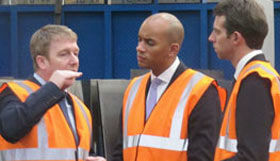 Chuka Umunna MP, Shadow Business Secretary and Will Straw, Labour's candidate for Rossendale and Darwen visited WEC Group Ltd yesterday to discuss Labour's business policy with staff and Commercial Director Wayne Wild. The shadow cabinet member said Britain needs more companies like WEC. He added: "The point of our policies is to grow those sectors of the economy that produce decent, fulfilling, well-paid jobs and help us pay our way in the world and compete. "A business like WEC Group illustrates what we are trying to achieve more of. It has grown through sustainable long-term investment, has a good business model, treats its workers well and therefore has good levels of productivity. "The problem is, we as a country don't have enough companies like the WEC Group." Description Commercial Director, Wayne Wild, discussing future plans. During his tour he heard how the company has just invested £500,000 in the latest technology to set up a new job-creating powder coating operation in its home town. The pair praised WEC Group's award-winning training academy – the only one of its kind in the country, saying "We have a chronic skill shortage." Wayne Wild, WEC Group's Commercial Director, explained the company's growth was based on continual investment in cutting edge machinery and in diversification. He also urged more government support for businesses the size of WEC Group, which aren't SMEs but are not operating on the scale of industrial giants such as Rolls-Royce. He said: "We are caught in the middle, between SMEs and the bigger powerhouse groups, and as a result I feel we are being largely ignored. "The support network exists for SMEs, but if we want to look at European funding, for instance, then we have to do it ourselves, with no support at all. And we have to finance the bid ourselves." Will Straw said he has enjoyed discussing Labour's plans with Wayne Wild and other staff at WEC Group and "look forward to putting them into practice after May if we win the election."